While hot weather and intense sunshine are certainly not in short supply around here, Floridians know that the weather is not always agreeable. Our location means that we sometimes have to put up with very serious storms, and in addition to high winds we also often face very heavy rainfall. Preventing that rainfall from flooding your home is a top priority. What is the best way to do so? Well, tight sealing and good construction are only going to take you so far. If water wants to get into your home, it will do so by any means possible. That is why one of the best pieces of advice that our professional plumbers can give you is to invest in a good sump pump. Leave your sump pump services in Brooksville, FL to our team. A sump pump is a very simple device. It is—well, it’s a pump! The sump pump is installed in the lowest point on your property, where water will naturally seek to pool in the event of flooding. 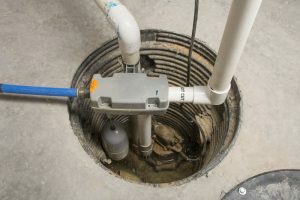 The pump is installed in a pit, called the sump pump, and either rests below the water level or, typically in smaller sump pits, sits atop a pedestal. When the water level reaches a certain point, it triggers a float switch that activates the pump. The pump will then pump water out of the area until the water recedes sufficiently. Even if you already have a sump pit in place, it is important that you hire professional plumbers to install and service your sump pump. You need to know for certain that all fixtures are tight and secure, and that your sump pump will handle the load that your property is likely to place on it. An overwhelmed sump pump is, after all, only marginally better than no pump at all! We can also inspect your sump pump regularly to ensure proper operation. Every now and then, grab a bucket and fill the sump pit until the pump activates. This is a simple functionality test. Schedule maintenance. Like a whole-house generator, this is a device that you’re (hopefully) not relying on frequently. Don’t wait for an inopportune time to discover problems. Consider a battery backup. This backup pump will still work even if the power goes down, which is likely in the type of conditions that would necessitate the use of a sump pump to begin with. Entrust your sump pump services to Bayonet Plumbing, Heating & Air Conditioning.